Just wanted to introduce myself and say that I've enjoyed reading the forum posts for many years now. I've been playing Mesa amps for the last 18 years. I own a Nomad 45, a DC-5, Mark V:25 and my favorite: the Express 5:25. I do mechanical engineering for a living, and I love to tinker with amps, speaker cabs, guitars and robotics. Once I figure out how, I'll post some pictures of my latest project which is a one-of-a-kind conversion of my Express 5:25 1x10 combo into a 1x12 Combo. Thanks to all for the interesting topics, useful tone tips and hilarious comments ! Hello and welcome. New to the forum but not to Mesa, as I see ! I have an Express 5:25 1x12 combo and I'm very interested by the Mark 5:25. Since you have both, can you tell me what differences you see between the two ? Welcome! I'm excited to see that combo come together. I'm new here myself. Thanks for being here. After much research, getting the Mark V25 with 2 Mini Recto cabs. Will post photos when it arrives. Last edited by guitar4jesus on Fri Dec 30, 2016 5:01 pm, edited 1 time in total. I apologize for flaking out on the pictures which I promised a month ago. Here's a link to my photo album showing some of the project. My goal over the past many years has been to buy the perfect portable tube amp with just enough power, awesome tone and super lightweight. Well, the Express 5:25 1x10 combo has awesome tone (as many of you know) but I could not handle the weight due to a previous back injury. So I built a custom lightweight cabinet and replaced the Black Shadow speaker with a Celestion Century Vintage. I am really liking it now with the 12" speaker (the 10" stock speaker had no bass whatsoever). I wasn't sure how it would look when finished, but I think it turned quite classy. For materials, I used rigid urethane foam core with a layer of thin plywood all wrapped it in carbon cloth. The edges are Maple. I also have balsa wood inserts where T-nuts are mounted. I still need to weigh it after getting the whole thing assembled, but it should be around 25lbs. I think it sounds great, but I'd like to A:B test it along side a stock Express 5:25 to hear the difference. 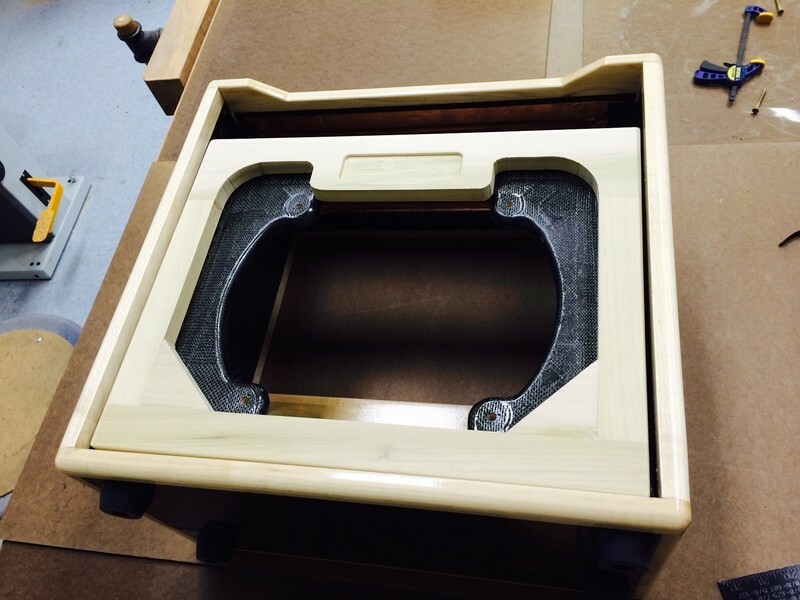 I previously built an open-backed, 1x12" speaker cabinet (not a combo) that was all foam and composite (no hardwood). It was incredibly light (10lb with the speaker installed). The downside to that first cab was that the un-reinforced composite skin would dent easily. So, I added hardwood edges to this one which gives it much better strength and, as a side benefit, an interesting 2-tone color scheme. I weighed it last night: 24.7lbs. Wow, I was close! GuyB wrote: Hello and welcome. New to the forum but not to Mesa, as I see ! my apologies for not responding to your question. You have excellent taste in amps! The main difference is the Mark's overdrive will begin where the Express left off. It's got way more gain than the Express. I think the Mark has tighter response too. One thing though, about my Express is I'm able to get the most Van Halen-like sound of any amp I've played. I plug my PRS Custom 22 straight into the Express and run it through a 2x12 closed back with Celestion Blues....oh yeah and I run an Eventide H3000 delay in the loop. That's my favorite sound. Thanks for the answer. And very nice work on your lightweight cabinet. Thanks again Charlie. Unfortunately when I had this cam built there was no internet forum like this to draw upon. I forgot to mention that the engine has been bored out to .0200. Would that alter your opinion?